We are very pleased to see the eBook being sold and schools and businesses getting back to us about their experiences during and after implementing Moodle in their Microsoft environment. 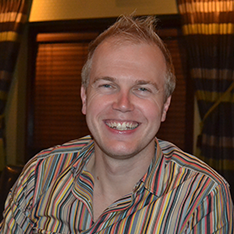 Gavin Henrick is a solutions consultant based out of Dublin, Ireland who works with assisting organisations to implement a range of open source products such as Moodle and Mahara. Gavin is also an author of Moodle 2.0 books include Moodle 2.0 for Business Beginners Guide and has given us a review of the our first ebook on his blog. You can read the full review on his blog – click here. If you are interested in purchasing this ebook in PDF, epub and mobil version you can from the BFC Networks shop. During the first 6 chapters we have looked at implementing Moodle 2.0 with Microsoft technologies such as Windows Server, SQL Server and Active Directory but having implementing all of these we can increase the user experience by configuring single sign on. As Kerberos was implemented in chapter 6 which will allow securer authentication but now we are going to implement Single Sign On so users automatically log on with out having to put their username and password in. During the configuration of single sign on you are required to know a bit about subnet masking. This is also discussed allowing you to implement Moodle 2 the way you want to. Kerberos was developed by MIT in the 80s to help with network security in a large network and has been used since Windows Server 2000 to increase security for users logging onto their domain computer. By using this ticketing solution your authentication is securer than basic or NTLM keeping your Moodle users securer from network intrusion or password sniffer tools. In this chapter we look into why implementing Kerberos with Moodle is important and also the step by step guide on how to implement it on a Microsoft based Moodle. Configuring Moodle with Active Directory can be very simple but it is important that it is also done to best practice with tight security. During chapter 4 we discuss how to connect Moodle to Active Directory with a dedicated user that you have created and given delegated rights to. This user only has permission to what it requires instead of giving them administrator access to the whole domain. Some of the great tools that have come out of Microsoft include the ability to have your environment running in a highly available farm. These can be achieved with hardware and software and Microsoft provide these functions using Load Balancing or services and clustering. In chapter 2 of the ebook we look at why you would implement Moodle 2.0 in a highly available environment and then we go through the stages of implementing a Microsoft SQL Server cluster, two web front end servers that are load balanced for Internet Information Services (IIS) and then configuring the MoodleData folder to sit on a separate NAS. Chapter 1 of the Moodle 2.0 in Microsoft Technologies book discusses why you might want to consider using Microsoft technologies instead of Linux, Apache and MySQL. Further into this chapter you are guided through the implementation of installing Moodle 2.0 on Windows Server 2008 R2 using PHP for Windows, IIS and SQL Server Express Edition. Using SQL Server Express Edition keeps the cost on Moodle on a Microsoft environment to its lowest allowing you to implement the learning management tool for the cost of a Windows Server license. SQL Server Express is free and can be downloaded from the Microsoft site. Over the course of the summer, Alex Pearce the Managing Director of BFC Networks has been writing a downloadable eBook based on Moodle 2.0 with Microsoft technologies. 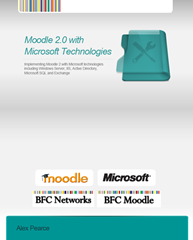 This book has specially been designed and written for technical staff who are looking at using Moodle 2.0 and wish to implement and integrate the website with Microsoft technologies. The first two chapter look and guide you through implementing the PHP based website on the Microsoft operating system Windows Server 2008 R2 on a single server and a highly available environment including 2 web front ends and a Microsoft SQL Server Cluster. The other chapters talk about how to configure Moodle 2.0 with Microsoft Exchange and how to configure authentication with Microsoft Active Directory. To ensure best practice, Alex has talked about creating new user accounts which then require special permission to Active Director ensuring your environment is secure at all times. The book is available from the BFC Networks Shop for $15.00.